Too Much Waste to Manage into Your Typical Waste Receptacle? Don’t Want to Take Multiple Trips to the Dump? That’s Ok! Drop ‘N’ Toss offers a delivery and pick-up service for roll-off bins. We offer 5, 10, 15 and 20 yard bins and can pick up any type of non-subject waste. Drop ‘N’ Toss can pick up waste, recycling, compost, dirt, concrete and brick. We even offer liquid waste Vac Truck Solutions from our other division. 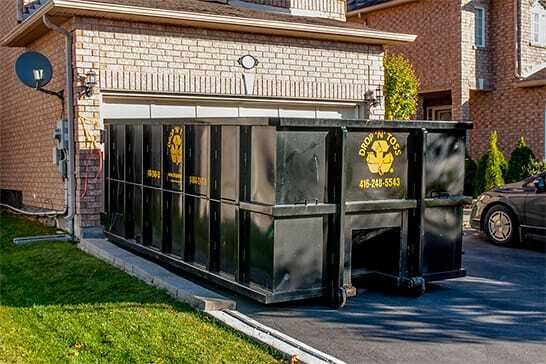 For Bin Rentals, drop-off and pick-up is included as well as 1 week rental. If the bin is needed for longer we can always accommodate that. If you have multiple waste streams, Drop ‘N’ Toss offers discount rates on multiple Bin Rentals at the same time to encourage diversion. If you are ever unsure if something is acceptable, hazardous or if it can be diverted to a more appropriate waste stream, just contact us for more information. We are always here to help. Are you looking at your waste pile and thinking, “There’s just too much. How will I do this myself?” Contact us for more information on our Full Service Junk Removal options. Drop ‘N’ Toss would love to do the lifting for you. Contact us for guidance, more information or a quotation. Common Uses: Typically used for clean fill such as dirt, concrete or asphalt. Materials must not be mixed in bin. Contamination may incur additional costs. Common Uses: Suggested for smaller cleanups of basements or garages and some small construction jobs like re-shingling. Also ideal for areas where larger bins won’t fit. Common Uses: These are great for general cleanups of the whole house or demolition and construction projects where you want to have a bin in your driveway, and still accommodate vehicles. Common Uses: A large bin for mass household cleanups that include furniture or other bulky waste items. Great for before or after moving, for cleanouts and renovations! *Rentals include up to 3 days. Additional days charged at $10/day. Hazardous materials, paints, oils, fuel, fridges, freezers, compressed gas containers, liquids, tires. This includes containers that are empty, partially full or full but is not limited to the above items. If your unsure, do not hesitate to check with us or your municipality for what is acceptable in landfills. Remember by aboding by these laws we are protecting the health and safety of ourselves and everything that lives.